Recently I visited Babcock State Park, located in the southeastern part of West Virginia. I had heard of the Glade Creek Grist Mill, and since I really enjoy taking historical old mill images, I was really looking forward to spending some time at Babcock trying to get some beautiful images of this mill. I also was counting on capturing images of the beautiful fall leaves. West Virginia has a trove of sights for the nature photographer to shoot. I happened to be at the park at what must have been the peak fall color season for that part of West Virginia. The colors were just dazzling! As I drove up I-77 from my home on the Blue Ridge Parkway in Virginia, I noticed a storm brewing as I neared the park’s entrance. Luckily, the recent rainstorm had enhanced the more subtle hues of the fall colors, saturating each leaf and imparting a glow to the scene. Plus, the storm had deposited a treasure trove of colorful leaves on the ground and in the creek itself. It continued to rain off and on as I was photographing and the thick cloudbank kept the lighting diffuse and soft. Although, I had seen images of Glade Creek Grist Mill many times, I was not prepared for the beauty of the mill in its fall color surroundings on this rainy day. I took a few minutes to survey the area in the rain before I brought out my gear. My first lens on camera was the 17-35 to capture as much of the color and surroundings as possible. I wasn’t getting what I wanted, so I stepped back and put on the 80-200 to get the framing I liked. I then turned my camera towards the falls that are located just downstream from the mill. There were new-fallen leaves everywhere. 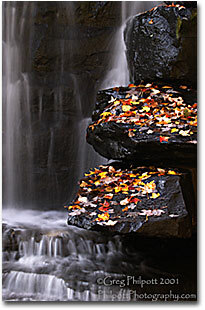 I took advantage of my good fortune and made several images of the falls and leaves. It actually started to sleet heavily as I was making these images. I took cover under some rocks until it subsided. I was only able to spend a couple of hours at the park, but it was a few of the most memorable hours spent behind the camera in a long time. I do plan to visit the park again with my family when I have more time, as there are clearly dozens more photographic spots I am excited about exploring further. I highly recommend Babcock State Park for nature photography as well as a vacation spot for families to enjoy. A good variety of accommodations are available for guests, including 26 cabins in two styles and a 51-site campground with 27 electric hookups. Among Babcock's recreational features are a swimming pool, extensive hiking and cross-country ski trails, horseback riding, a seasonal interpretive program and Boley Lake, a 19-acre impoundment for boating and fishing. The park offers its guests 4,127 acres of serene, rugged beauty featuring a fast flowing trout stream in a boulder-strewn canyon and mountainous vistas to be viewed from several scenic overlooks. The park is absolutely beautiful in the fall season, and I am sure it is just as outstanding throughout the rest of the year. To add to the beauty of the surroundings is an attractive stone building, which serves as the park headquarters. It contains a family style restaurant and gift shop for state souvenirs. 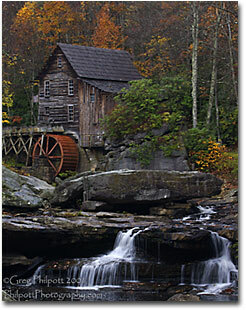 The main attraction of the park is the Glade Creek Grist Mill. It was built by combining the parts of several old mills throughout the state of West Virginia. This fully operable mill offers freshly ground cornmeal, buckwheat and whole-wheat flour to park guests. Located in Fayette County in south central West Virginia, Babcock State Park is easily accessible from Beckley and points south by following US 19 north. At the US Rt. 60 exit travel east 10 miles to State Rt. 41 South. Babcock's campground is 2 miles south of Rt.60 at Clifftop, while the main park entrance is 2 miles south of Clifftop. From Charleston, follow Rt. 60 East to Rt. 41 South. From the east, follow I-64 to the Sam Black Church exit, and then follow US Rt. 60 West to Rt. 41 South. From the north take US 19 exit off I-79 and follow US 19 to US Rt. 60 East to Rt. 41 South. For more information, please visit the Babcock State Park website. All Images Nikon D1x, AF-S 17-35, AF-S 80-200, NEF’s processed with NC2. Polarizer used to reduce glare on leaves and water. Tripod for support. Editor's Note - View more of Greg's work at www.philpottphotography.com.